Although the actual population of Branson is just above 6,000, Branson has become a major tourist destination and entertainment city, attracting more than seven million visitors each year. 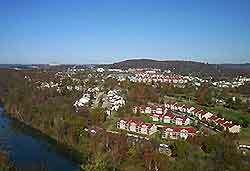 Standing in the state of Missouri MO, in Taney County, Branson is close to the stunning Ozark lakes and Arkansas border, to the south of nearby Springfield. Containing almost 50 theaters and music venues, with more than 100 live performances daily, the center of Branson is the Strip, which is lined with shopping complexes, restaurants, museums and hotels. 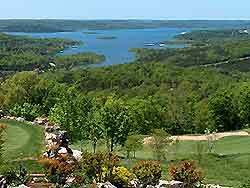 Nicknamed the 'Ozark Disneyland', other tourist attractions in Branson include superb golfing, fishing, swimming, boating, water-skiing and hiking, particularly around the breathtaking Table Rock Lake. There are plenty of affordable hotels throughout Branson, many of which are concentrated in the city center, along the Shephard of the Hills Expressway, Green Mountain Drive and nearby highways. Representing all levels of accommodation and budget, hotel rooms in Branson should always be reserved in advance. More information about Branson Hotels. Tourism is now a major part of life in Branson and the city's main tourism center is the Branson / Lakes Area Chamber of Commerce, which can be found along the junction of Highways 65 and 248. Full of helpful tourism information about sightseeing and excursions around the Branson area, the tourist information office contains a wealth of brochures about all kinds of tourist attractions and tourism in many of Branson's neighborhoods, including Downtown Branson, Indian Point, Shepherd of the Hills, the Falls District and the Strip. Branson has many popular tourist attractions, such as the Branson Scenic Railway - a historic 1905 depot located in downtown Branson, offering excursions into the beautiful countryside; Celebration City - a major multi-million dollar theme park, with more than 30 rides and a host of family entertainment options; Ride The Ducks - 80-minute guided tours, around both central Branson and also in the waters of the magnificent Table Rock Lake; White Water - a popular water-based amusement park, with slides, geysers and fun for all ages; Silver Dollar City - contains a range of fast rides, family attractions and specialty shops; and the Butterfly Place - around 2,000 butterflies, housed in a vast glass building with information about their life cycles. Other important tourist attractions in Branson include the Grand Palace Theater - a Victorian building, which remains the largest performance theater in Missouri; Showboat Branson Belle - a recreation of classic historic paddleboats, offering a variety of cruises on Table Rock Lake; the IMAX Entertainment Complex - an impressive modern entertainment center, featuring a range of shops, restaurants and a theater; Inspiration Tower - at the Shepherd of the Hills, offering panoramic views of the area; Marvel Cave - the deepest cave in Missouri, known for its enormous entrance room; the Veterans Memorial Sculpture - the largest bronze war memorial sculpture in the whole world; Lakeside Forrest Wilderness Area - with wooded trails, views over Lake Taneycomo, trail and an impressive waterfall; and Table Rock State Park - covering around 356-acres / 144-hectares, this vast park contains of outdoor activities based around the large lake. 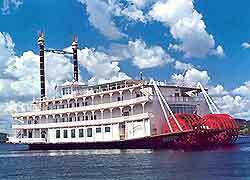 More information about Branson Tourist Attractions and Branson Landmarks. Some of the main museums and galleries in Branson include the Hollywood Wax Museum - boasting more than 170 waxworks of famous television and movie stars; the Branson Ripley's Believe It or Not Museum - a fascinating museum with hundreds of curious exhibits in different themed galleries; Branson's American Presidential Museum - with information about the American democratic process, with a replica of the Oval office and Air Force One; the Roy Rogers / Dale Evans Museum - celebrating the lives of famous duo Roy Rogers and Dale Evans; the World's Largest Toy Museum - a popular Branson attraction housing an enormous collection of toys, from the 1800s to the today; and the Veteran's Memorial Museum - featuring thought-provoking wartime exhibits and historic war-related information. 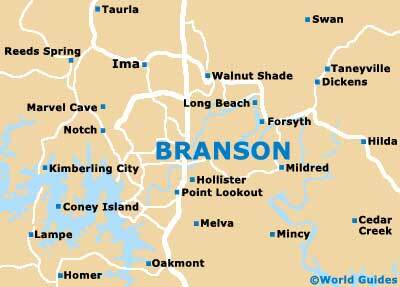 More information about Branson Museums and Branson Art Galleries. Tourist attractions close to Branson include the Abundant Memories Heritage Village - consisting of 25 picturesque buildings, with a presentation of American history; Cosmic Cavern - close to Branson, featuring two 'bottomless' cave lakes and guided tours; Bonniebrook Homestead - housing a museum with original Rose Cecil O'Neill artifacts and memorabilia; the College of the Ozarks - boasting a neo-Gothic chapel, a museum and picturesque landscaped grounds; the Shepherd of the Hills Fish Hatchery - Missouri's largest trout production facility, situated to the southwest of Branson; and Stone Hill Winery - the oldest winery in Missouri, with tours and wine tasting. More information about Branson Attractions Nearby.